Toys can be a never-ending battle when it comes to clutter. If anyone should know this, it would be me since I have not one, but nine children! Toys are great, but they all need a home, and they can quickly become out of control and create enormous amounts of toy clutter. This is why coming up with some toy storage ideas and strategies is so important. This is especially true if you need to tame that toy clutter in small spaces. 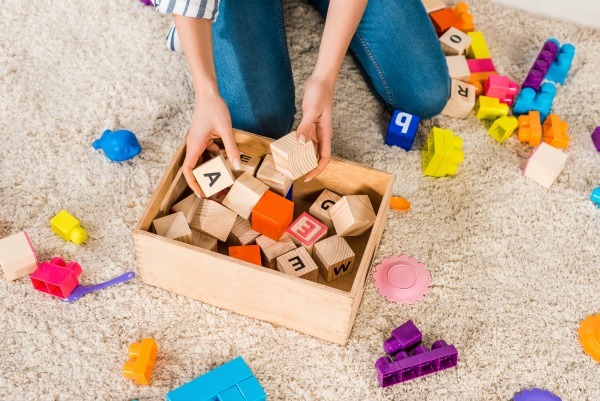 Whether you are needing toy storage ideas for kids bedrooms, living rooms, playrooms or other spaces in your home, these questions that make up a universal toy storage checklist will prove to be your best friend. Before we go any further, you can get this toy storage checklist in printable form. Just enter your email below to have it immediately delivered right to your inbox! 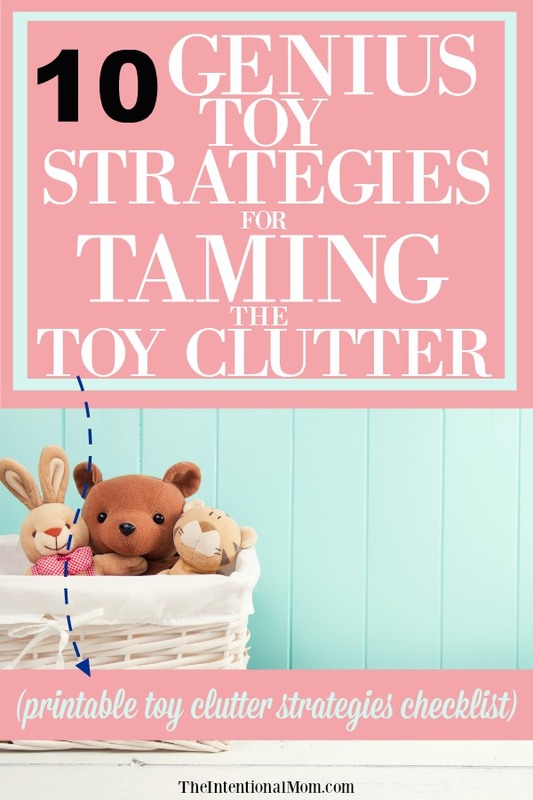 Grab Your Toy Clutter Strategies Checklist! Grab your freebie & subscribe to get our latest content by email. Success! Now check your email to grab your checklist & confirm your subscription. 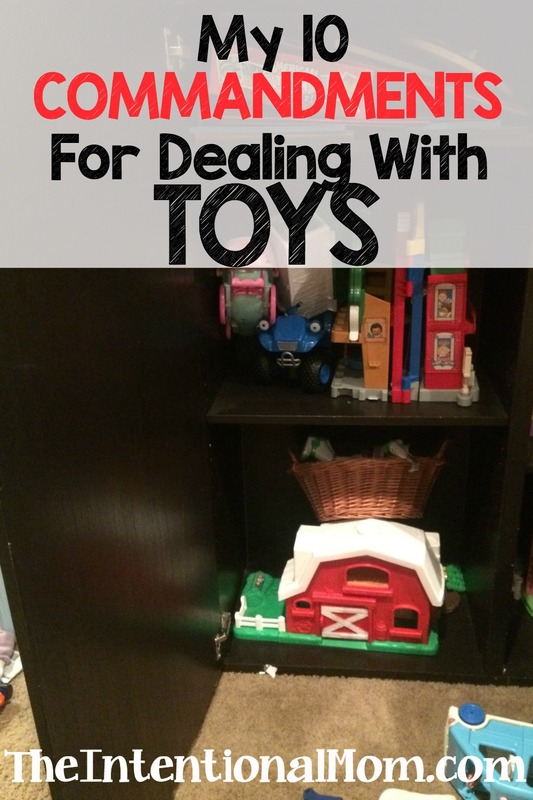 Do you find yourself wondering how to manage toy clutter? Then check out these genius strategies for controlling all that toy clutter! Size really does matter when it comes to toys because you have to store them all. This was something that I didn’t really pay all that much attention to with just one child. But let me tell you, after a few kids this became the most important part in my toy clutter strategy. These days, there are several toys we never even give a second thought to because they are simply too big to store. This is especially true in small spaces. 2. What is the longevity value? Is this a toy that will be more than just a quick thrill? Is there something more to it? Are there variations of the toy that will allow it to appeal to your child today and in the days to come? Toys that somehow transform or have multiple levels or possibilities are more worthwhile than those that don’t. If it is a toy that is easily broken, this is also something to take into account. 3. How many pieces and parts does the toy have? I have come to loathe toys with all kinds of pieces and parts. Especially those that are easily stepped on. First, all these pieces and parts can make the toy too complex for children to be able to deal with on their own. Second, these pieces and parts make it more possible that a toy will become unusable rather quickly because pieces and parts become lost or broken. Missing parts that will still allow the toy to be usable aren’t as bad. However, be sure to take various pieces and parts into account when deciding what toys to bring into your home. Multi level toys are again a plus when it comes to children of varying ages using them. We have three little boys ages 8,6, and 4, and many of the toys we have entertain them all, and they can all play as a group. These are the very best toys to have. 5. How much adult involvement is needed? Adult involvement isn’t always a bad thing, but paying attention to what level of involvement is necessary is the concept to keep in mind. There is nothing worse than counting on a toy to entertain your child on their own, only to find that there is no way that is possible after you already own it. Investigate this idea fully beforehand. Then, decide if the level of adult involvement and time required makes this a worthwhile toy to own. Some toy packaging is really great, but most just takes up way more space than it is worth. Carefully assess the packaging the toy comes with to determine whether it is worth keeping. Cute does not always mean practical, especially when it comes to package clutter. Often, I find other containers to be of greater value than what actually comes with the toy. When dealing with toy clutter and toy storage strategies, practicality and functionality outweighs the cuteness factor. Do your kids really need the entire Thomas train set? Are all the Polly Pockets really necessary? What about Little People. How many of them do your kids need? I find that variety almost always beats out owning entire sets. My kids get bored with the same thing. Having 50 of the same toy is not nearly as interesting as having 10 toys that are part of five different sets. Several smaller sets with more variety is almost always what my kids prefer. So often we feel that more is better. But in the case of toy organization, this is rarely the case. 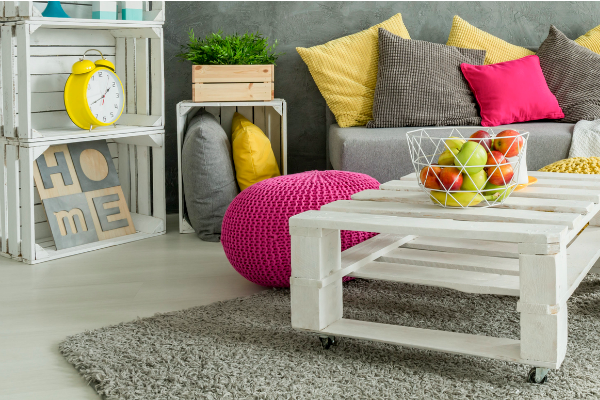 Whether you are keeping toys in a basket or bin, on a shelf or in a cabinet, or simply on the floor, toy storage must be practical. This is even more true if you are expecting your kids to have any part of putting their own toys away. Think ease of use first and foremost. Kids need things to be painfully easy when it comes to picking up. Otherwise, they just won’t do it. Toy rotation is simply packing up some of your kids toys for a time. Then, a couple of months later haul them back out and fill the box with other toys to be taken out of commission for awhile. I find kids don’t play with toys as often if they have too much to choose from, and then there is the clutter to deal with. Rotating toys out every couple of months is like having Christmas all year round. You can read a bit more about this in Why I Packed My Kids Things Up and Five Reasons I Still Do It. As with nearly everything else, regularly purging helps keep clutter under control. Some things to keep in mind are…is the toy still getting played with, are pieces missing, do you have a toy that is almost the same thing? Set aside a regular time to purge, once every couple of months perhaps, and then set about purging toys. You can sell them, give them to someone you know, or donate them. There is no reason to hang on to toys that are no longer serving their intended purpose in your home. If you find yourself being emotionally attached to your kids’ stuff based on all the memories, you should read this post on emotional collecting. Clutter is never fun, but I think toy clutter might just rank up there with paper clutter in my book. Putting some simple guidelines in place can be so helpful, and these 10 commandments for dealing with toys have been an amazing answer for me.